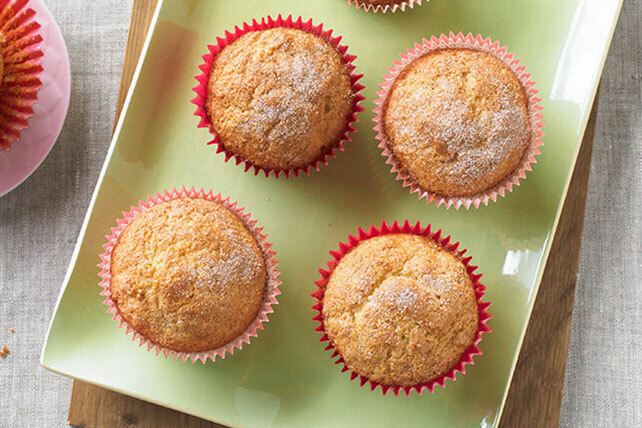 Our Easy Banana Muffin recipe turns out moist, delicious muffins that taste a lot like everyone's favorite quick bread—but they're handy, on-the-go snacks. Spoon into 12 paper-lined muffin cups. Mix remaining sugar and cinnamon; sprinkle over batter. Bake 22 to 24 min. or until toothpick inserted in centers comes out clean. Cool in pan 5 min. Remove to wire racks; cool. Cooled muffins can be stored in tightly covered container in freezer up to 6 weeks. Thaw in refrigerator before serving.